Brooks was the third running back selected, a spot the Seahawks needed to address after the retirement of Marshawn Lynch and with Thomas Rawls recovering from a broken left ankle suffered in December. RENTON — The Seahawks concluded their participation in the NFL draft Saturday by taking running back Zac Brooks in the seventh round, with pick No. 247. That was the 10th pick for Seattle in the draft and the third running back, a spot the Seahawks needed to address after the retirement of Marshawn Lynch and with Thomas Rawls recovering from a broken left ankle suffered in December. Brooks saw limited time at Clemson. He missed the 2014 season because of a foot injury. But he impressed scouts when he ran a 4.32-second 40-yard dash at Clemson’s pro day in March. He also recorded a 36-inch vertical leap. The Seahawks attended the pro day and he later made a private visit to the team’s facility. 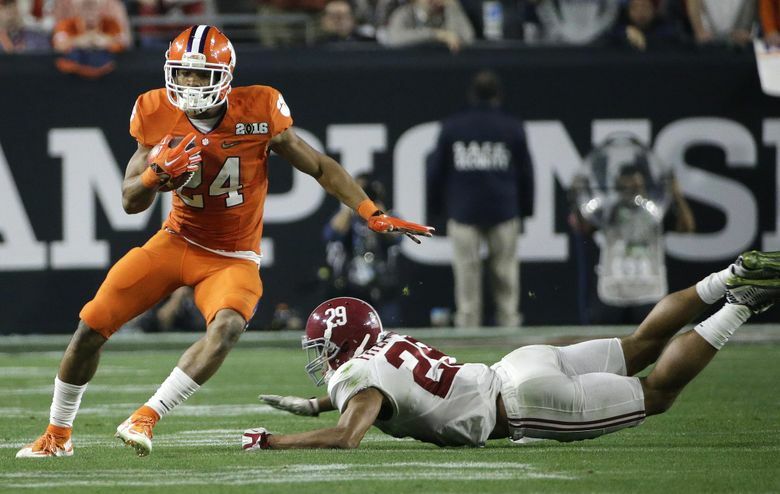 Brooks had 234 yards on 41 attempts last season at Clemson, averaging 5.7 yards per attempt. He also caught nine passes for 113 yards. He left Clemson, which advanced to the national-title game before losing to Alabama, with a year of eligibility remaining.